finally got around to doing a teeny bit more Cyber cropping!! 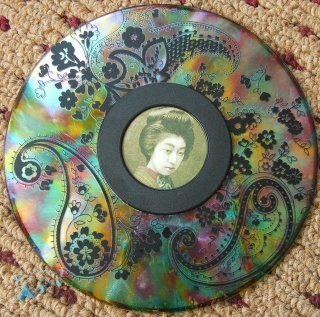 did one of the challenges which was to create an altered CD, used alcohol inks, wholly cow rub-ons a circular slide mount and the picture comes from the oriental ATC pad. I really quite like this as a piece of art! Amazing what you can do with an old CD!! The mottled alcohol inks background has come out really well on the photo and rub-ons on a cd - didn't think they'd rub off due to the slickness of the plastic. In all, a very nice piece of work: looks lovely. Don't worry to much though as the time before last was 20 years ago! !